BACKTIME: Where Were You 20 Years Ago Today? I am occasionally asked what is the most memorable sporting event I worked. There are a bunch, but that afternoon in Orchard Park, NY probably is at the top for a couple of reasons. As a producer I'd have to say the biggest game was BYU knocking out Sam Bradford and upsetting #3 Oklahoma in the first game in the Jerry Dome. But I was still in a truck, somewhat detached from the moment. I've worked MLB, NBA and NHL playoffs, NCAA Tournament games, and major tennis championships. But 20 years ago I was in a broadcast booth with the windows open and history unfolding and building to a crescendo. I was 23 years old, and trying to get some footing in the business. I went to school for on-air work but had shifted toward production, having some experience under my belt with USA, CBS, and ESPN. I was getting work but had no job (kind of like now), and was scrambling around the country in my Honda Civic picking up work all over the place. On this particular weekend I was coming from a Syracuse basketball game and headed to a Washington Capitals hockey game - or the other way around. 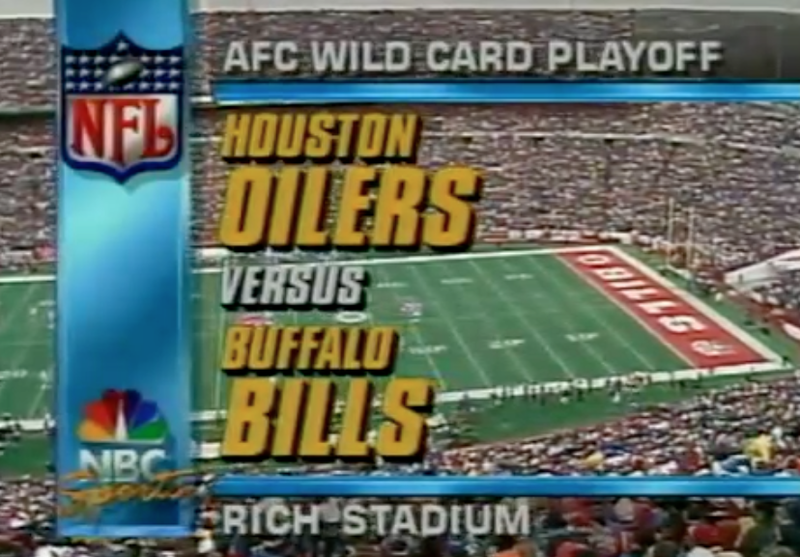 Anyway I had landed a gig doing stats for the radio broadcast of the Oilers-Bills Wild Card game through the show's producer, the late Norman Baer, whom I had met in a baseball pressbox that previous summer. What people don't remember about the game is it wasn't sold out and thus blacked out in the Buffalo viewing area. 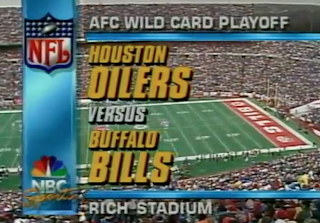 Maybe having lost the last two Super Bowls made a home Wild Card game a little anti-climactic. 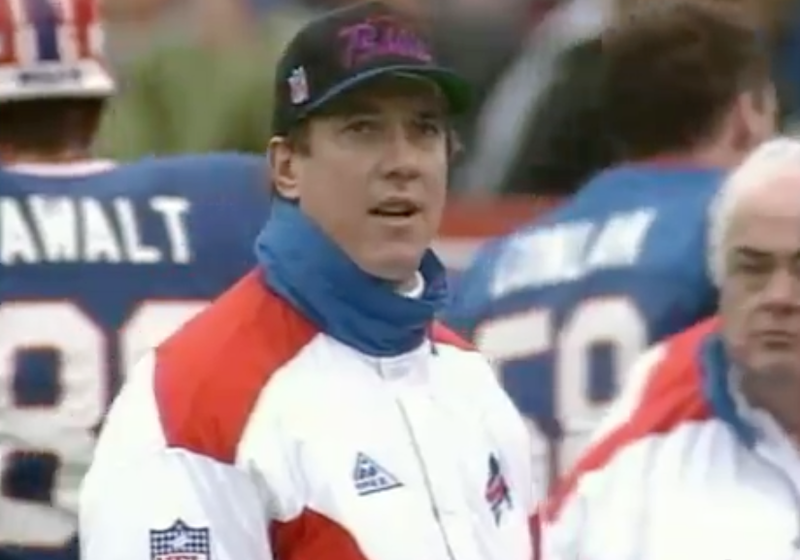 That and star QB Jim Kelly was out. At halftime, the no-shows looked pretty smart. With Kelly out and losing Thurman Thomas early, the Bills were eaten alive by Warren Moon, who threw 4 TD passes in the first half on the way to a 28-3 lead. Then early in the 2nd half, Bubba McDowell took a tipped pass and raced for a Pick Six. It was 35-3 Oilers. Radio analyst Pat Haden (calling the game with Howard David) famously said that the game was "over." What happened next is of course the greatest comeback in the history of sports. But it wouldn't have been possible without the Bills players and coaches who never quit, and their great fans who never gave up. 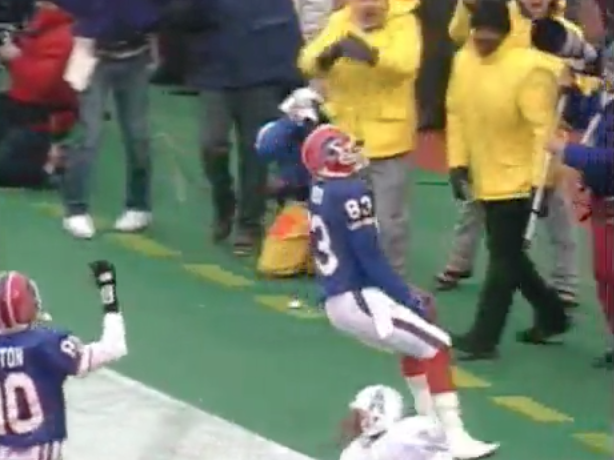 The Bills scored to make it 35-10, and then onside kicked and recovered. You could feel the crowd gaining momentum and Jack Pardee and the Houston sideline getting pensive. Then when Don Beebe scored a (very illegal) touchdown to close it to 35-17, you couldn't keep a lid on the place. A crowd desperate for a reason to believe found one. Backup QB Frank Reich, who had led Maryland to the greatest comeback in college history against Miami, coming back from 31-0 down in 1984, methodically took the Bills down the field drive after drive. Andre Reed, a 7-time Pro Bowler who should be in the Hall Of Fame, did not have a great 1992 season with only 3 TD catches. He had 3 in the 2nd half from Reich. That was one of the unique stats I was able to generate for broadcast Another was if you combined Moon's 1st half (4 TD) and Reich's 2nd half (4 TD), you would have the single-greatest passing game in NFL history. When it went to Overtime, you had a feeling the inevitable was about to take place. The Oilers won the coin toss, but Moon threw an interception. 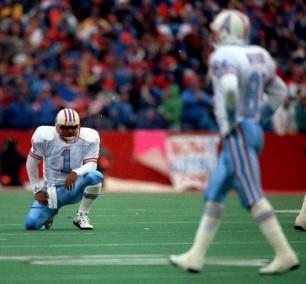 And Reich, who was the backup QB most of the season, was also the holder for Steve Christie's game-winning Field Goal. So he was on the field for the culmination of the history he made. I got back in the Honda Civic and drove out of Buffalo. I kept the game credential and my stat sheets for several years, but they got lost somewhere along the way. Now it's just a memory.